Hey folks. Just a short message to humbly ask for some money. Peoples’ Action for Rights and Community, now open each and every day (almost) for 8 1/2 years, borrowed $200 for June 2016 rent. We need to pay it back. And we’re coming on July, too. Bills, rent, toilet paper, you know. 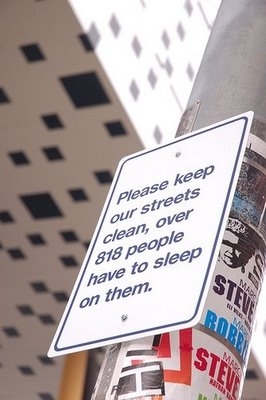 If you’re new to PARC, please read some of our previous, more detailed “panhandling” posts/emails. Please help and pass this on to more people who might be able to support a fully grassroots, volunteer and donation-based resource and organizing center. We appreciate you. Simply, we are in solidarity with all oppressed peoples’ and want our work to help create a healthier, more caring world. 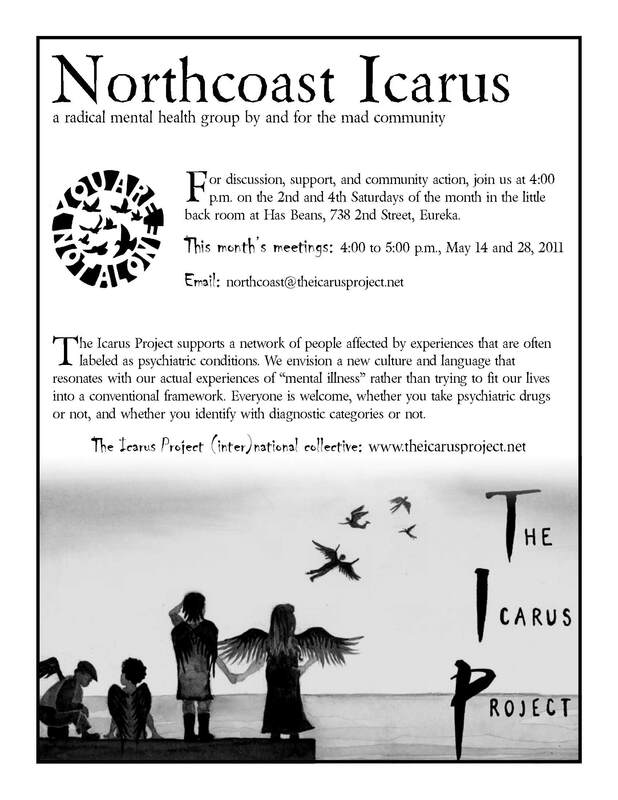 The Icarus Project is meeting this Saturday (April 9th) in the little back room in Has Beans in Eureka at 4:00 pm. After announcements, we will be discussing the topic of superpowers– How does your madness gift you with special abilities? ie. creativity, intuition etc. The Icarus Project will be meeting this Saturday, March 26th in the little back room in Has Beans from 4-5pm. We will be discussing the topic what radical mental health means to you. Just as a heads-up, we’ll be watching/discussing the film Crooked Beauty at the Community Wellness Center (908 7th Street, Eureka) at 5:30 on March 24. We can plan details at our next meeting, but for now, put it on your calendars and start inviting your mad friends and allies to come with you! We’ll be doing a brief, informal presentation at Raven on March 17th. For those who want to help, let’s get together and plan! I’ll contact people who I know were interested to set up a time, or let me know if you want to be included and we haven’t talked yet. We’re making plans for an art show, talking about a potential tabling/workshop opportunity, putting up fliers for March meetings (I’ll make you copies for you if you need some to distribute), and doing other things I’m forgetting about! They’re still the 12th and 26th at 4:30 p.m. in the little back room at Has Beans. Join the Fight to END THE WAR ON THE POOR! 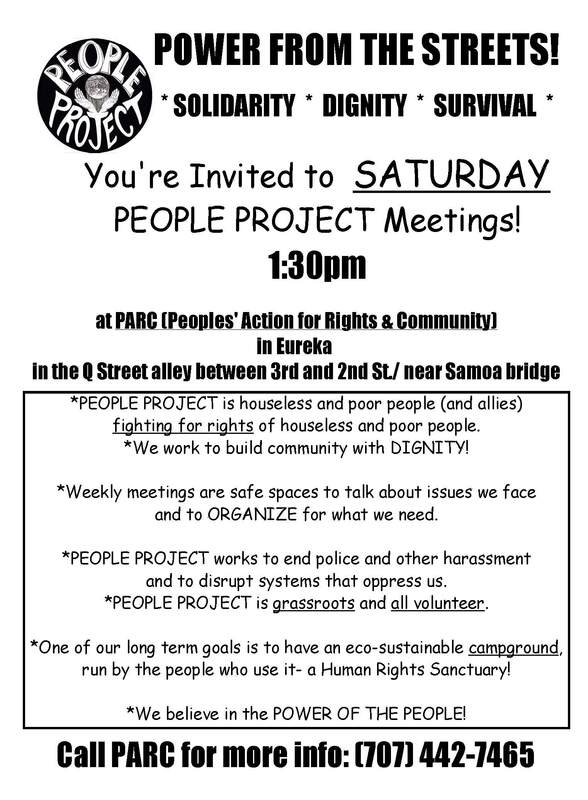 Come to SATURDAY PEOPLE PROJECT Meetings!